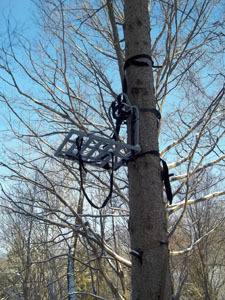 Hang on tree stands are also commonly referred to as lock on stands and need a climbing aid to get to the stand. These climbing aids, such as climbing steps or a climbing stick, will enable you to climb the tree, fixate your stand, and climb back down. The steps can be the screw in type or strap type. Hang on stands come with either a strap or chain to attach them to the tree. I prefer to add at least one ratchet strap for a more solid connection to the tree. The downside to these tree stands is that you get only the basics. You don’t get a full seat, but rather a padded cushion to sit on and rarely is a backrest or arm rest included. While some hunters say these stands are very comfortable for long hours of sitting or standing, you may not like the limited features. The upside to a hang on stand is that they are light weight (10-20 lbs) and are easy to setup and take down, meaning they can be easily moved. Hang on stands are typically the lowest in price and offer versatility when it comes to tree selection. The tree does not have to be perfectly straight and the stand can be attached to a wider range of tree sizes. They are also very quite when hung. It is a good idea to use a climbing belt when hanging this type of stand. Not only for safety but the belt makes it much easier to use both hands while hanging the stand.